Miami Trace’s Macy Creamer (5) controls the ball moments before she scored in the second half of a match against Westfall Thursday, Sept. 6, 2018 at Miami Trace High School. The Miami Trace Lady Panthers varsity soccer team hosted the Mustangs from Westfall High School Thursday evening. Miami Trace won the non-league match, 2-0. 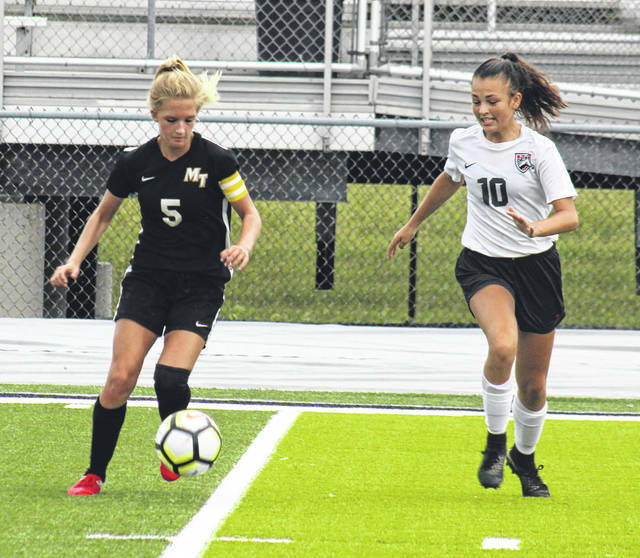 “We came out much stronger in the second half than we did in the first and we able to capitalize on our offensive attacks,” Miami Trace head coach Caitlin Francis said. Macy Creamer scored with 29:01 left in the game from an assist by Magarah Bloom. Isabella Vanover also scored with an assist from Krissy Ison with 11:33 left in the game. Khenadi Grubb had six saves in the goal for the Lady Panthers. Miami Trace is now 3-1-1 overall. They are 1-1 in the FAC. Miami Trace will host Sheridan Saturday at 11 a.m. In other local girls soccer Thursday, Southeastern defeated Washington, 5-3 and Unioto topped Jackson, 6-1.